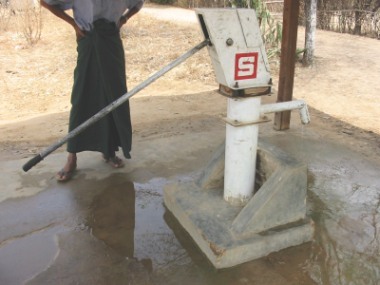 Travelers visiting Thu-Htay-Kan, after its well was operating, asked that an additional village with similar needs be selected. Thit-Htaunk-Kyun Village, also in the Bagan area, was chosen. This digging was not as complicated as in Thu-Htay-Kan, so a manual pump could be installed, which greatly reduced the cost for the project. Generosity in Action immediately approved and funded the installation of this well. It was operative in the fall of 2003. We later requested that a third village be selected and that another well be installed before the end of 2004. Funds were donated and the project completed. Later we finalized a project to build a school in this same village. View other photos in this village. 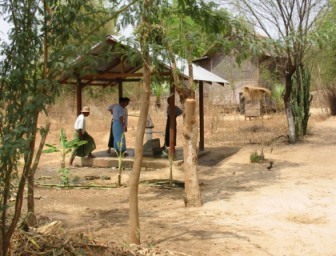 Read the proposal in the "Recap of projects in Burma."